Here is episode 59 of my Culture Leadership Charge video series. How leaders treat team members is critically important in your organization. If leaders treat employees with respect and fairness, great things happen. Employees solve problems, proactively. They treat their peers and their customers respectfully. They share information so everyone succeeds. However, if leaders treat employees with distain, dismissing and discounting their ideas, efforts, and accomplishments, lousy things happen. Employees disengage. They watch and wait. They withhold information. How employees perceive their bosses directly impacts results and respect. I coach leaders of organizations large and small to not make any assumptions about what their employees think. 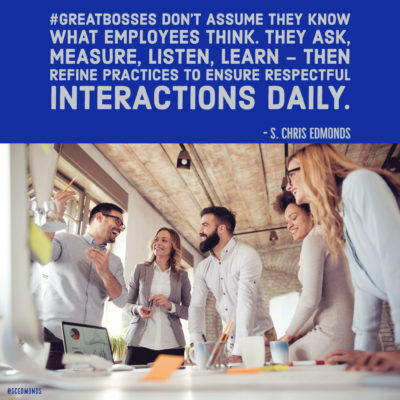 Leaders must ask, measure, listen, and learn – and then refine leader’s behaviors to ensure both results and respect happen daily. 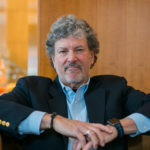 In today’s three-minute episode of my Culture Leadership Charge video series, I share how to measure the quality of leaders’ treatment of others – and share ratings of two sample valued behaviors by attendees of a recent keynote. Photo © Adobe Stock – ivanko80. All rights reserved. How do your great bosses keep their “fingers on the pulse” to know employee perceptions of their leaders? Share your insights or questions on Twitter, Facebook, and LinkedIn.